The game, the fever of it actually, has stolen my heart. It has come into our lives with a crescendo that is unexpected and contagious, and we wait for the day that we hear the blow horns in the streets that signal the beginning of a World event that we get to host!! Okay, so you don't love the game that most of the world is obsessed with. Too bad!! The reason that soccer unites the world is because it is a universally spoken language; an art form; the mathematics of the sports world. It is, in fact, the great equalizer. Here, in Johannesburg, the game is easy to get excited about. Our friends talk about it with the same fervor as all-night prayer meetings, and we gleefully accuse them of worshiping football. School rugby fields have given way for uniformed Afrikaans boys and girls to "kick like Kaka" (funny to hear the kids utter a forbidden word...when used in discussion of football it's referring to the Spanish star, Ricardo Kaka). Townships stop selling lapa roofing (thatch) and clear the thatch fields for a game between the best adults who don't play for a living. Everyone breathes in expectation and breathes out excitement. In 9 days and 11 hours the first kickoff of the 2010 World Cup (Mexico vs. South Africa) will start the frenzy that we have giddily braced ourselves for: our shining moment as a country, at least in sport. 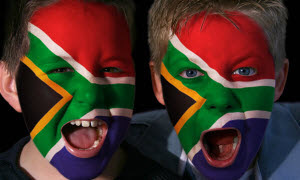 The eyes of the world will see a close-up of the RSA (Republic of South Africa) and not see strife or apartheid, but rather what this country has become- a nation with 11 official languages, yet strangely homogenized. A country of Spiritual strength but still wild. Everywhere are signs of hype and excitement: The Absa balloon, usually red and white with our national bank logo stenciled on the side, is a soccer ball hoisted above Monte Casino. The fueling stations have soccer balloons everywhere, street vendors sell flags of the world (we just bought a controversial Mexican one) and on Fridays the whole city wears yellow and green - Bafana Bafana colors. Coming from a girl who was always picked last for every sports team ever assembled (and with good reason) this sounds funny, but I want to learn the diski and bop the ball from one foot to another to in between my shoulders. I just hope no one is watching as I learn.